An ideal family breed, the Norwegian Buhund is gentle with children, but not afraid to bark a warning if a stranger approaches; a warning sufficient enough to warn potentially dangerous individuals away. Though the breed is naturally loving and well-balanced, it is important that they are given regular mental and physical exercise as well as early and consistent training and socialization. Be aware, a Buhund that is bored will find a way to entertain itself. well-balanced and general cheerful, this breed learns quickly but can be over-sensitive to harsh correction as they are very eager to please. This is a herding dog and they will herd anything that moves, from squirrels in the backyard to small children, but they are a gentle breed that gets along well with children when raised with them. The Norwegian Buhund is an "easy keeper" breed with few upkeep requirements. Weekly brushing is encouraged, especially during shedding seasons, to keep matts and debris from building up in the coat. The Buhund likes to pretend as though its starving and can quickly become obese; do not let your Buhund convince you to give it more food than what is recommended by your veterinarian. Additionally, Norwegian Buhund like to bark in communication, so additional training may be necessary to train your Buhund to communicate with you in a less vocal fashion. 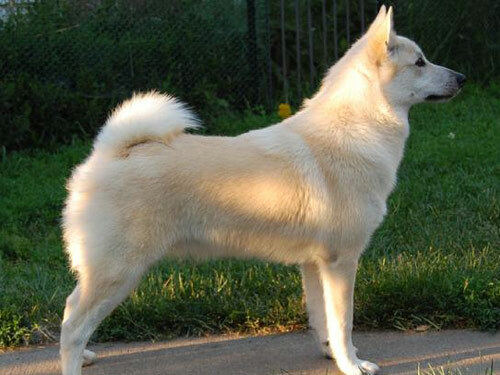 A relatively hardy breed, the most common health concerns found in the Norwegian Buhund are cataracts and hip dysplasia; a condition in which the hip joint is improperly formed. Cataracts can only be diagnosed by a specialist. Most dogs with cataracts live full and normal lives, but it is important to discuss the heritage of your dog before purchasing and if your puppy develops cataracts you should inform the breeder so that they can continue to help remove the responsible recessive gene from the gene pool. An ancient breed, remains of the Buhund have been found in Viking grave sites over 1000 years old. A multi-purpose pooch both then and now, the Norwegian Buhund serves as a farm dog, livestock herding dog, and guard dog. The breed is very much considered to be a utilitarian breed and serves a number of purposes. The breed was established for show in 1939 by Jon Sæland and was recognized as a Herding dog by the AKC in 2009. Nowadays, in addition to its traditional work on farms, you can find the Norwegian Buhund working as everything from a therapy dog to narcotics detection.